Disseminating information about Core services and personnel. Maintaining up-to-date module usage records and budgets including VUMC Scholarship allocations. Maintaining calendar of seminar series and communicating seminars of interest to VVRC community. Planning travel arrangements for visiting scientists and prospective trainees. Maintaining IRB and IACUC records. Organizing VVRC Module Directors meetings. Maintaining up-to-date mail lists of administrators, faculty, staff and trainees. Serving as liaison to other units within Vanderbilt, to vision research centers at other institutions and to the National Eye Institute. 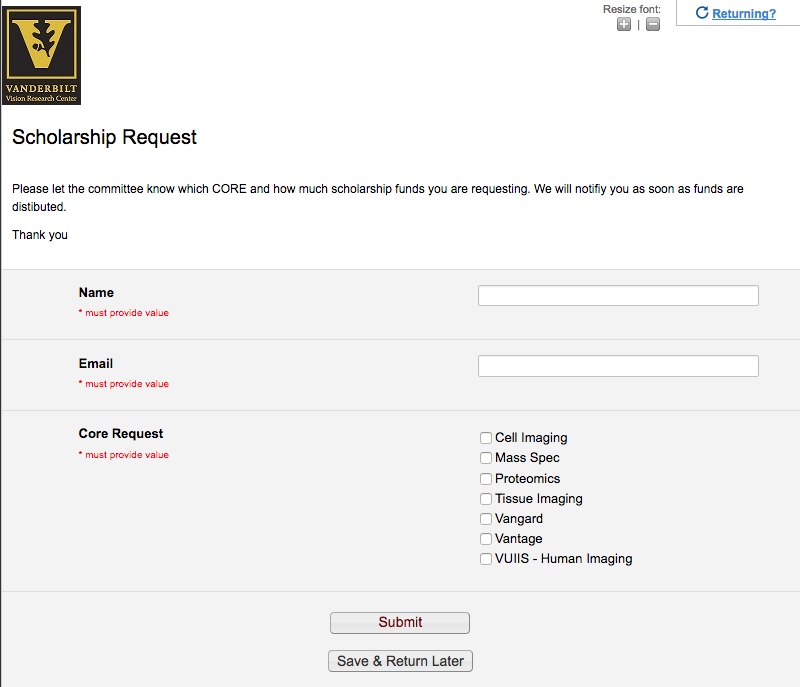 Need to fill out a CORE scholarship request? Go to the official VVRC Core Scholarship RedCap form by clicking the image below.